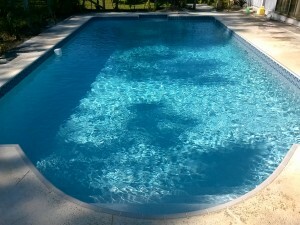 Swimming pools are a great way to keep cool and have fun during the warmer summer months. As swimming pool sales have increased over the years, more and more consumers are learning how to maintain and keep their swimming areas up to par for their families and guests. Whether consumers have opted for an above ground pool or made the investment to dig in-ground, there are general tips and tricks every owner should know when it comes to their maintenance and upkeep. Pools that have turned green or black are signs that they have been neglected and need special treatment before they are ready for human use once again. The first thing owners should do is clear out all large and small pieces of debris that can be captured with a net. These large leaf nets are generally more efficient at removing debris than a simple skimmer. While these nets will stir the water of the pool, the water color may begin to look worse than it did before; nevertheless, all physical matter must be removed from the pool waters. It is especially important for owners to avoid vacuuming the bottom of the pool if the bottom surface is not visible or if cluttered with debris. If debris exists on the bottom, it may eventually clog the vacuum, costing hundreds in repairs and replacements for owners. Alkalinity and pH levels must be checked, maintained, and adjusted. If owners are unsure about the content of the water, many local pool cleaning service company’s will come out to test the water or allow consumers to bring in samples so that a diagnostic test can be administered. If a swimming pool is particularly dirty, owners may need to add gallons of chlorine over a range of days for the water to return to its normal level. Local pool cleaning service company’s might also be able to assist with specialized chemicals and treatments for the swimming area, but chlorine is particularly important for a very dirty pool. 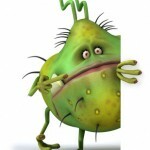 Many owners will run the filtering system for 24 hours and then backwash for 3-5 times a day for quick results. While green or cloudy water can quickly clog a pool filter, the more times a pool is backwashed, the quicker it will clear. 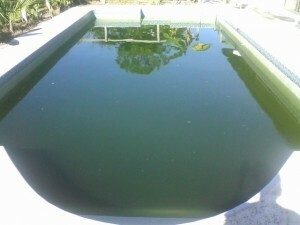 With the addition of chlorine, the pool should clear up within a week’s time. If this does not occur, there could be a problem with the filter or the backwash process. Consulting with a pool professional or a local business with experience in pool water might be a wise response to this. If the pool clears up within five to seven days, owners might be able to then see debris that was previously on the floor of the swimming pool. Some consumers prefer to have their pools vacuumed professionally with a power vacuum, a process that could save hundreds in filter repairs and replacements. By following these tips, pool owners can be ready to treat their swimming pools to the best of their ability this summer and in time for their next pool party!